You are here: Home / Obituaries / Barclay White, Jr.
Barclay White Jr., 90, passed away on October 6, 2012, at Willow Valley in Lancaster, Pa. He was born on September 23, 1922, the son of Barclay and Edith (Lewis) White. He was married to Margaret Harris on April 2, 1949. He was a graduate of the George School (1940), Swarthmore College (BS,1943) and the University of Pennsylvania (MBA,1947). He joined Barclay White and Co. in 1949 and ultimately served as President and Chairman. 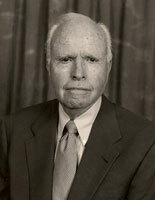 He was Chairman of Barclay White, Inc. from 1978-1991, and a Partner with Glencoe Associates from 1986 to the present. A member of West Chester Friends Meeting, Barclay served on the Board of Friends Hospital, the Fleer Corporation, Skytop Lodge and on the Executive Committee of Westtown Friends School. He was President of the Carpenters Company, a member of the General Building Contractors Association, the American Society of Civil Engineers, the American Arbitration Association Construction Panel, and the National Association of Professional Engineers. An avid golfer, he was a past member of Rolling Green, Radley Run, Merion, Riverwood, and Hershey’s Mill Golf Clubs. He was a member of both Pine Valley Golf Club and the Ozone Club for more than 50 years. A squash player, Barclay was a member of The Racquet Club of Philadelphia and founder of the South Penn Wood Squash Racquets Association. A devoted fly fisherman, he was a member of the Parkside Angling Assn., and the Angler’s Club of Philadelphia. Barclay is preceded in death by sisters Mary Elma White Price and Helen Jacobson. He is survived by sister Margaret White Winters. In addition to his wife Maggie of 63 years, Barclay is survived by children James and wife Kimberly, Barbara Griest and husband Wayne, Elizabeth Burke and husband J.R., Barclay III and wife Beth, Stephen and wife Tammy, grandchildren Kate White Vanek and husband James, Kristen White Christman and husband Grant, Sarah McFarland Willey and husband Douglas, Rebecca McFarland Lee and husband Christopher, Jeffrey Lewis Griest, Dewey Burke and wife Megan, Michael, Brendan and Brady Burke, and Joseph and Lindsay White. Barclay had three great-grandchildren, Cole and Chase Willey, and Campbell Lee. A Meeting for Worship will be held at the Westtown Meeting at Westtown School in the coming weeks. In lieu of flowers, please send donations in his honor to Westtown School, Westtown, PA.
Offer Condolence for the family of Barclay White, Jr.
My deepest sympathy to all of the White family. Your Father was a wonderful person and a kind gentleman. I always enjoyed his company at family gatherings. You are all in my thoughts and prayers. Your Dad is an awesome person and I will always remember him for the kindness he extended to me. My prayers and condolences to my friends of the Barclay White Jr. family. To all the wonderful children of the White family.. my sincere condolences. But as my mom says it is not “IF” it is “When”, We will all be saying good bye to the best generation in the next years. What a sad thought. Our love and memories will be our comfort. Carolyn and the Evans family.